Eroni Mawi of BLK Naiatsiri runs through the Lautoka defence at Ratu Cakobau Park yesterday. Photo: PAULINI RATULAILAI. The Naitasiri rugby team continued with their good form in the Skipper Cup competition when they walloped Lautoka 31-19 at Ratu Cakobau Park, Nausori yesterday. What happened: Lautoka started well and in the first 20 minutes where they were able to maintain possession and was competitive upfront. But it was not enough to hold the Naitasiri forwards as they were strengthened by the return of skipper Jerry Naureure, Apisai Rinamalo at lock along with former Vodafone Fijian 7s forward Manueli Laqai who was their openside flanker. Lautoka went 3-0 up after fullback Vatili Tuisabeto kicked in a penalty. The lead was short-lived when Naitasiri forwards worked their way deep into Lautoka’s territory where Selesitino Kalounivale scored their first try which was converted by first five eight, Etonia Rokotuisawa. Tuisabeto kept Lautoka in the game with another penalty. 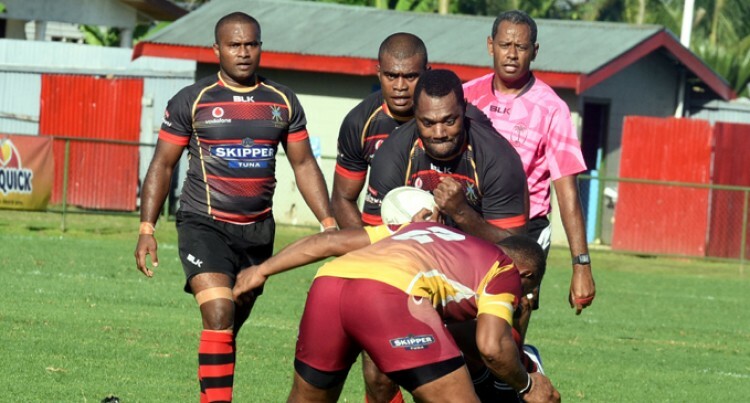 Poor communication was Lautoka’s downfall as they continuously committed unforced errors. Naitasiri backed by their vocal fans capitalised on those mistakes, which resulted in Laqai diving over for their second try, as they led 13-6 at halftime. Lautoka again opened the second-half with another penalty. Naitasiri regrouped and struck back with tries to Sevuloni Lutu, Vilimoni Malorua and Naureure while Rokotuisawa kicked in his second penalty. The Maroons managed to score a consolation try to Viliame Satala which Tuisabeto converted. Big play: Naitasiri forward pack laced with experienced players led by Naureure dominated most phases of the game. Comments: Naitasiri head coach Reverend Jioji Rinakama said, “It was a good game for us.